Long live the King! That’s what one offshore sportsbook is preaching by going against the industry grain and setting LeBron James and the reigning NBA champion Cleveland Cavaliers as the favorites to win the 2016-17 NBA title. Sportsbettingonline.ag did not follow in the footsteps of sportsbooks in Las Vegas, who installed the Golden State Warriors as their 2016-17 front runners, instead setting LeBron & Co. as +175 chalk ahead of the Warriors at +260. Golden State is a consensus favorite across the board in Nevada, with most Las Vegas books dealing the Warriors as 2/1 favorites to avenge their historic collapse – up 3-1 on the Cavs in the finals – and win their second title in three years. But after watching Cleveland come back from that lofty deficit, Sportsbettingonline.ag believes there’s blood in the water as it pertains to the Golden State’s former dominance. Speaking of Golden State’s Western Conference rivals, the San Antonio Spurs are the third overall favorite on the board at Sportsbettingonline.ag, opening at +550, and the Oklahoma City Thunder are sitting at +850 despite the uncertainty surrounding superstar – and free agent – Kevin Durant. The Los Angeles Clippers round out the Top 5 favorites at +1,100 odds. In the Eastern Conference, Cleveland’s closest threats are the Boston Celtics (+1,400), Miami Heat (+1,600), and Toronto Raptors (+2,200), who regardless of finishing second overall in the East are getting very little respect from Johnson and his oddsmakers. 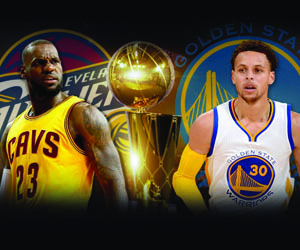 Click here for Sportsbettingonline.ag’s full list of the 2016-17 NBA Championship odds.